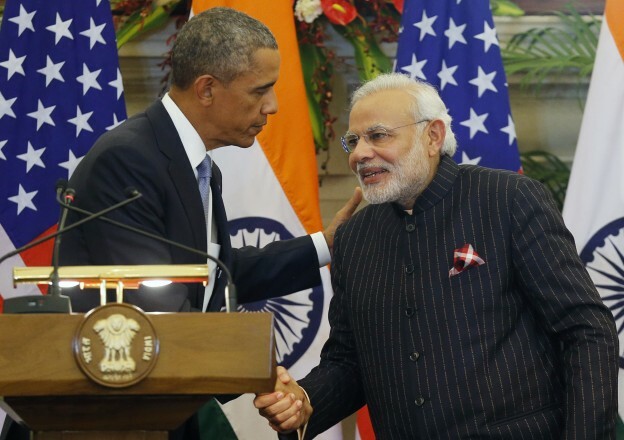 Developments from the Fall and Winter of 2014 to the 2015 Modi-Obama Summit"
In the late 1990s, after decades of geopolitical alienation during and the Cold War, President Bill Clinton called America and India “natural allies.” In the 2000s, the George W. Bush administration had built a strategic partnership with New Delhi centered on normalizing India’s status as a nuclear weapons state and strengthening military ties. But it was not until President Barack Obama’s visit to India for Republic Day in January 2015 that an American leader found an Indian interlocutor who was unembarrassed to embrace (literally and figuratively) the United States as New Delhi’s premier international partner. This newfound sentiment reflects not only the unusual strength of Prime Minister Narendra Modi’s domestic political base—he is the first Indian leader elected with a party majority in three decades—, but also the changing politics within India over US relations. Unlike their predecessors, India’s aspirational generation is not shy of closer ties with the United States, which they understand is essential for both India’s security in a dangerous neighborhood and its economic transformation. Modi himself appears to have come to understand that the United States can play a pivotal role in helping India prepare against a long-term Chinese military challenge, while serving as a singular source of capital and technology to escalate India’s development trajectory. This is somewhat unexpected. As chief minister of Gujarat, he had been subject to a US visa ban on account of communal violence that occurred on his watch in 2002. Observers had expected him to act cool towards the United States because of this and to prioritize relations with East Asia’s economic giants, such as China and Japan, in order to attract the capital and investment India desperately needs to modernize. However, since taking office last May, Modi has pulled off a neat hat trick in foreign policy. His initial outreach—starting literally on the day he was inaugurated—was to India’s neighbors, including Bangladesh, Nepal, Bhutan, and Sri Lanka. Modi understands that India cannot rise to become a world power if its immediate neighbors fear, resent, and balance against it in league with unfriendly powers like China, whose influence along India’s periphery grew dramatically under the previous Indian administration. Modi’s personal attention and a kinder, gentler set of neighborhood policies—as well as fortuitous changes, such as the election of a new government in Sri Lanka that tilts away from Beijing and towards New Delhi—already have shifted the South Asian balance of power and influence towards India’s direction after years of tug-of-war with China and its ally Pakistan. Modi’s second step was to engage in vigorous but qualitatively different forms of outreach to East Asia’s principal powers. He made an early visit to Tokyo to solidify a strategic and economic axis reinforced by Modi’s close personal ties with Abe Shinzo, Japan’s similarly nationalistic, growth-oriented prime minister. Modi secured not only an unprecedented Indo-Japanese military partnership but also a commitment of Japanese investment in India worth USD 35 billion. He then hosted President Xi Jinping for what was to be a friendly visit focused on turning a new page in India-China relations by securing a significant new commitment of Chinese trade and investment. However, Modi was personally affronted when, on the eve of Xi’s arrival, China launched a military skirmish along the two countries’ contested border. Chinese troops were pushing into Indian-claimed territory even as India’s prime minister welcomed China’s top leader to a red-carpet treatment. Chinese diplomacy claims to be subtle, but Beijing seriously miscalculated. A summit meant to deepen economic cooperation was overshadowed by a military standoff, and Modi learned that China was unlikely to be a partner India could trust. The third step in the new Indian government’s overseas outreach was to the United States. Modi visited Washington last September; his summit with Obama produced an unusually detailed joint declaration that laid out a range of areas in which to deepen Indo-US cooperation. Notably, this included the South China Sea, where India and America declared a joint interest in freedom of navigation and overflight and against any use of force to change the status quo, making an indirect jab at China. Modi then offered to host Obama for India’s Republic Day parade—a first for a country whose traditional non-alignment stance led it to fete leaders from Asia, Russia, and the developing world rather than the West at this annual ceremony. It was also highly unusual to schedule two summits with an American president only four months apart, but the two leaders obviously had much to discuss. On January 25, 2015, Modi met Obama on the Delhi airport tarmac with a bear hug that The New York Times called the signal of a new great game in Asia—between India and the United States on the one hand, and China on the other. Although somewhat exaggerated, once they got down to business, China did dominate the conversation between the leaders of the world’s biggest democracies. Its military pressure on America’s forward-deployed posture in East Asia, its attempts to drive wedges between the United States and its allies, and its assertive attempts to whittle away at freedom of navigation and overflight in the East and South China seas, for the United States, mirror China’s military pressure on India’s northern border, its military and political penetration of India’s neighbors, and its naval “string of pearls” all along India’s maritime periphery, from Gwadar in Pakistan to Hambantota in Sri Lanka to Chittagong in Bangladesh. In 1998, following India’s nuclear tests, Clinton’s advisors launched a strategic dialogue with New Delhi that led them to express surprise at how closely American and Indian views of the strategic challenge posed by China aligned. During the subsequent Bush administration, American and Indian strategic dialogues focused on the central Chinese challenge to Asia’s balance of power. During his Republic Day visit in 2015, President Obama’s advisors once again expressed astonishment at how closely Indian and American views of China’s military threat converged. That Americans have spent 17 years being surprised by India’s hawkishness towards China—during a period when three different Indian administrations of varying political orientations held office—is a reflection of Washington’s lack of appreciation of the profound strategic competition that animates India-China ties. Obama and Modi have a similar balance to strike with Beijing. On the one hand, China is a critical trading partner, and neither India nor the United States seek conflict with the rising superpower. On the other hand, China’s military buildup and aggressiveness risk overturning an Asian balance of power currently tilted towards the United States and its friends. This holds potentially dangerous implications for the region’s prosperity, rooted as it is in freedom of navigation and overflight and American security guarantees to key powers like Japan and Australia. The assurance provided by US military commitments in East and Southeast Asia has helped to underwrite the Asian economic miracle, from which India until recently was excluded on account of its socialized and highly protected economy. Modi’s central ambition to transform India economically risks being thwarted by more intensive security competition with China that pushes the United States out of its traditional role as regional security guarantor, creating dangerous instabilities across the Indo-Pacific. In short, India needs the United States to help balance Chinese power in Asia so that Modi can get on with his central goal of developing India’s economy. It stands to lose from any US retreat from Asia that leaves India alone to manage the threat posed by its northern neighbor, which would require an enormous infusion of resources into national defense and away from the drivers of domestic development. Modi and Obama, therefore, discussed quite openly a variety of ways to strengthen Indo-US defense and security cooperation. These include, in the bilateral channel, a new 10-year defense agreement between the two countries to facilitate joint military education and training as well as plans to promote not only US defense sales to India (the world’s largest arms importer), but also defense co-production premised on the sharing of sensitive but potent US military technologies. Beyond bilateral cooperation, Modi and Obama discussed reinforcing Asia’s fragile security architecture by deepening US-Japan-India strategic cooperation and invigorating a quadrilateral partnership among these three countries along with Australia. When the “Quad” held some of Asia’s largest military exercises to date in 2007, Beijing protested vehemently, formally demarching all four capitals and condemning their plans to forge what it called an “Asian NATO.” India was the weakest link in that grouping, which otherwise was comprised of America and its core Asian allies. That India’s leader is now proposing the Quad’s resurrection and upgrading is a reflection of how badly China has played its hand in Asia in recent years, alarming not only US-allied nations but also non-aligned states like India and nudging them closer to the Indo-Pacific security network centered on the United States. Gone are the days when India was a subcontinental state of marginal importance to the world’s great powers and an international security order centered on Western Europe and the Middle East. As security crises in both Europe and the Arab world fester today, India under Modi is defining itself as an Indo-Pacific power with a central stake in the future of East Asia. Indeed, Obama and Modi agreed on a joint vision document for the Asia-Pacific that defined their common strategic interests in the region stretching from East Africa to East Asia, and underscored their joint objective of maintaining freedom of Asia’s maritime commons— especially the South China Sea—that are under pressure from armed Chinese revisionism. The IMF projects that India will grow faster than China next year. Should Modi continue to liberalize the Indian economy and improve its governance, India is likely to maintain higher levels of economic growth than China for the next few decades. China’s economy is multiples larger than India’s, in part because China launched reforms in 1979 and India waited until 1991 to begin opening up, and even then somewhat hesitantly. China is at the center of global supply chains from which India, lacking a manufacturing base and until recently mostly closed to foreign investment, remains excluded. Powered by a strong demographic tailwind—half of India’s population is under 25, and two-thirds of Indians are under 36—, India will have the world’s largest workforce and drive middle-class growth for the next few decades. As the US National Intelligence Council has assessed, by 2030, we are likely to regard India as the kind of global economic engine that China has been for the past decade. India’s growing economy and its strategic geography ultimately will enable it to become the predominant power in the Indian Ocean region, from the Persian Gulf in the West across to Southeast Asia (where India’s Andaman and Nicobar islands sit at the mouth of the Strait of Malacca, making India a resident power at the gateway between the Indian and Pacific oceans). India’s growing entente with Japan and deepening ties to Southeast Asia will create a natural maritime coalition of nations allied with the United States. It is no wonder that Chinese officials, who expect their neighbors to accommodate themselves to Chinese primacy, appear alarmed by the new warmth in relations between Washington and New Delhi—and that leaders across the rest of Asia seem encouraged as they realize that the pluralism made possible by an India-Japan-US concert would be a firmer source of security and prosperity than would a predominance of Chinese power in the future Asian order.